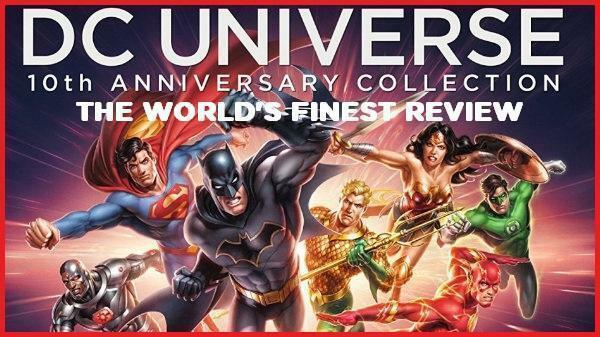 The World’s Finest has published its review of the DC Universe 10th Anniversary Collection Blu-ray box set (aka DC Universe Original Movies: 10th Anniversary Collection), which is now available to own now on Digital and Blu-ray. In short, for fans looking to own the entire line in one gorgeous package – either for the first time or to get the complete set – or completists and collectors looking to add to their personal library, the DC Universe: 10th Anniversary Collection is a fine addition to anyone’s collection. For the entire review, which includes a detailed breakdown of the exclusive bonus content and package quality, click on the image below. For more content – including other reviews, exclusive interviews and so much more – check out the The World’s Finest DC Universe Original Movie subsite. The subsite covers every single movie in the popular home video line up to the current release – from Superman Doomsday to Batman and Harley Quinn – along with a plethora of exclusive interviews, reviews, images, videos and much, much more. Every single DC Universe Original Movie is covered in detail, so there’s plenty to explore. DC Universe: 10th Anniversary Collection is currently available to own on Digital HD and Blu-ray via digital and retail outlets. To note, there is exclusive content available only on the Blu-ray edition of this title. Stay tuned for further reviews and updates in the weeks to come right here at The World’s Finest. 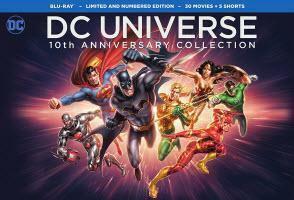 Click here to discuss the DC Universe 10th Anniversary Collection Blu-ray box set! You can also share your thoughts on social media via The World’s Finest Facebook and Twitter pages! 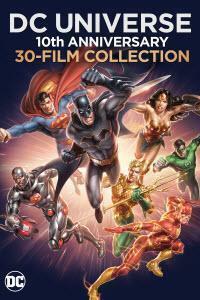 Warner Bros. Home Entertainment has released a new sizzle reel trailer and updated press details, including a rundown of bonus content for the DC Universe Original Movies: 10th Anniversary Collection Blu-ray box set. The massive collector’s edition release will hit shelves on November 7, 2017. Press details and the trailer, which can be viewed by clicking on the player, are available below. A decade of ground-breaking DC Super Hero animation spanning 30 full-length feature films and 5 animated shorts, combined with new bonus features, the complete catalog of prior enhanced content, commemorative extras and exclusive collectible items makes the DC Universe Original Movies: 10th Anniversary Collection a must-own when Warner Bros. Home Entertainment and DC Entertainment release the limited edition, numbered Blu-ray™ box set on November 7, 2017. The content of the DC Universe Original Movies: 10th Anniversary Collection – beyond the 30 animated films – will be discussed during a commemorative panel at New York Comic Con on Thursday, October 5, 2017 in the Javits Center. Panelists included executive producer Bruce Timm, supervising producer James Tucker, co-producers/writers Alan Burnett and Jim Krieg, and a cavalcade of actors who have played essential roles in multiple films in the series – the two prominent voices of Batman in the DCUs, Kevin Conroy and Jason O’Mara; John DiMaggio, who has voiced characters in eight films, including the Joker in Batman: Under the Red Hood; Tara Strong, the voice of characters in seven movies, most notably Batgirl in Batman: The Killing Joke, and the two-time voice of Wonder Woman, Vanessa Marshall. DC Universe Original Movies: 10th Anniversary Collection Blu-ray™ box set is limited to 20,000, and each box will be individually numbered. This collection is priced to own at $299.99. It is now available for pre-order. 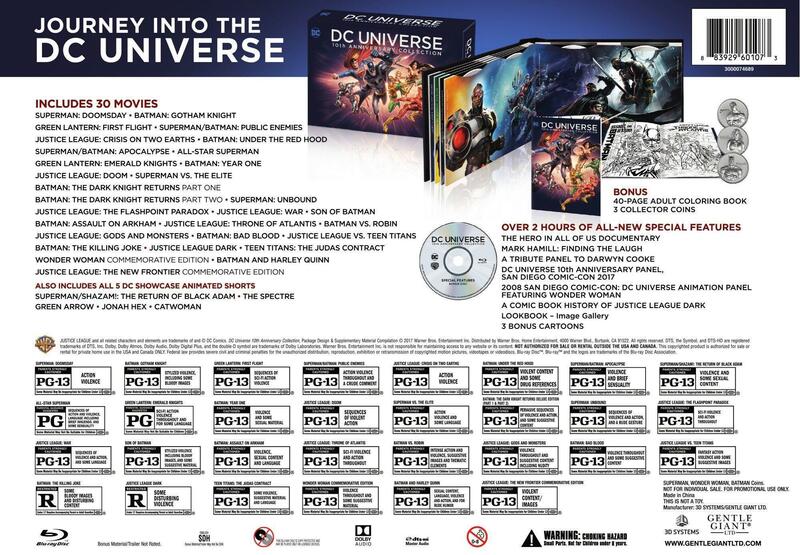 The DC Universe Original Movies: 10th Anniversary Collection features two collectible items of particular note: an exclusive 40-page adult coloring book featuring key art from all DC Universe films, with artwork designed by renowned artists exclusive for this collection; and exclusive collector coins featuring the DC “trinity” – Batman, Superman and Wonder Woman. Launched in 2007 with the landmark release of Superman Doomsday, the DC Universe Original Movies are based on or inspired by storylines and/or characters from within the ever-expanding DC library. Produced by DC Entertainment and Warner Bros. Animation, the stories range from films based upon iconic DC Super Hero stories (Superman Doomsday, Justice League: The New Frontier, Batman: The Dark Knight Returns, Batman: The Killing Joke) to films inspired by themes from within DC history (Batman vs. Robin was inspired by “The Court of Owls,” Superman vs. The Elite was inspired by “What’s so Funny About Truth, Justice and the American Way?”) to original stories (Justice League: Gods and Monsters, Batman and Harley Quinn). The DC Universe Original Movies: 10th Anniversary Collection will include all 30 films – from Superman Doomsday to the all-new Batman and Harley Quinn, as well as newly released commemorative editions of Wonder Woman and Justice League: The New Frontier. 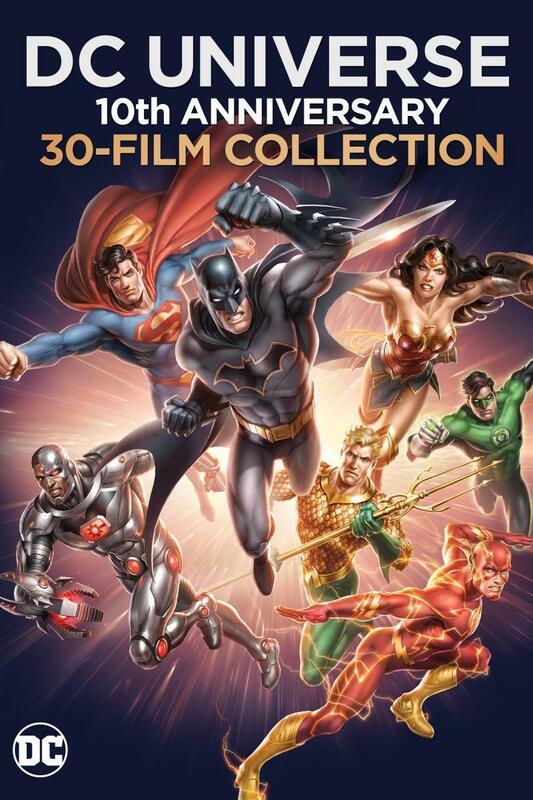 The 32-disc box set will also include all 5 “DC Showcase” animated shorts – The Spectre, Green Arrow, Jonah Hex, Catwoman and Superman/Shazam: The Return of Black Adam. •	Featurette – “The Super Human In Us All” –Some Heroes are born in the pages of DC comic books (Superman, Batman, Wonder Woman), some are the real life heroes that have faced life or death, and triumphed against the odds. The quest in this film is to find that common ground, reminding everyone that there is a hero in all of us … waiting to rise! •	Featurette – A Comic Book History of Justice League Dark – Take a mystical journey through the comic book history of the Justice League Dark: John Constantine, Zatanna, and Deadman, magical heroes who flourish in the shadows – and their specialty, the supernatural side of the DC Universe. •	Featurette – “Mark Hamill: Finding The Laugh” – This mini-documentary follows the journey of celebrated actor Mark Hamill from his portrayal of heroic Luke Skywalker to the role of one of the most feared DC Super-Villains of all-time, the Joker. •	DC Universe Original Movies 10th Anniversary Panel at 2017 Comic-Con International – Ten Years. Thirty films. Five shorts. And innumerable fan-favorite moments. Warner Bros. Home Entertainment celebrates a decade of animated DC -infused films with an exciting panel spotlighting the DC Universe Original Movies: 10th Anniversary Collection. Filmmakers and an array of luminary voice actors guided fans through an entertaining look into the making of these popular movies. Included in the panel discussion are producers Bruce Timm & James Tucker and co-producers/screenwriters Alan Burnett & Jim Krieg alongside actors Kevin Conroy, Tara Strong, John DiMaggio, Vanessa Marshall and Christopher Gorham. •	Lookbooks for Batman: The Dark Knight Returns, Justice League: The Flashpoint Paradox, Batman: The Killing Joke, Justice League: Throne of Atlantis and Superman/Batman: Apocalypse. •	Panel Discussion – A Tribute to Darwyn Cooke – Legendary writer and artist Darwyn Cooke left the world far too early. This panel gathering celebrates through personal and professional anecdotes the achievements and heart and wisdom Darwyn brought to his projects, and his life. •	2008 Comic-Con International Wonder Woman (Animated) Panel – Harken back to 2008, during the infancy of the DC Universe Original Movies, when the Comic-Con stage filled with some of the key players in the production of the highly-acclaimed animated film, Wonder Woman. Included on the panel is former DC Publisher Paul Levitz, DC Universe executive producer Bruce Timm, Wonder Woman director Lauren Montgomery, eight-time Emmy Award-winning dialogue/casting director Andrea Romano, and geek god himself, Nathan Fillion, who voiced Steve Trevor in the film. DC executive Gregory Noveck moderated the panel. 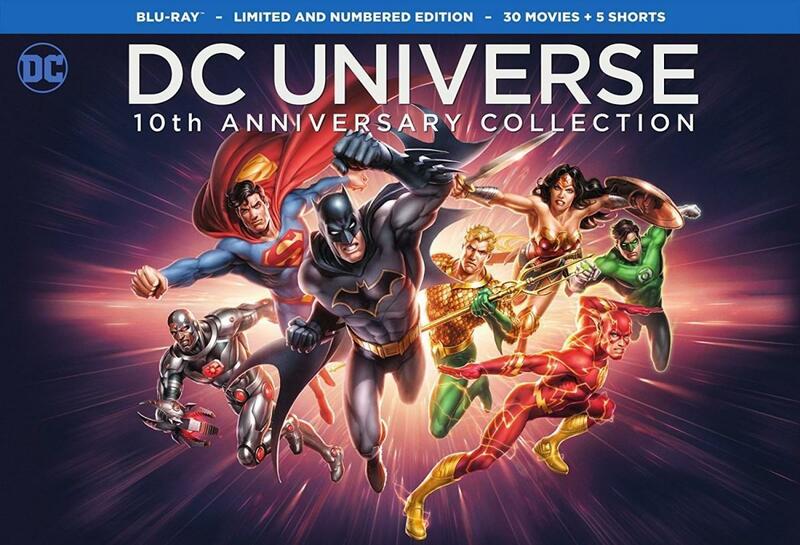 The DC Universe Original Movies: 10th Anniversary Collection is now available on Digital. TM & © DC Comics. © 2017 Warner Bros. Entertainment Inc.
Warner Bros. Animation (WBA) is one of the leading producers of animation in the entertainment industry, producing and developing projects for multiple platforms, both domestically and internationally. WBA’s TV series include Justice League Action, Teen Titans Go! and the upcoming DC Super Hero Girls and Unikitty! for Cartoon Network; Be Cool Scooby-Doo!, Bunnicula, Dorothy and the Wizard of Oz, The Tom and Jerry Show, New Looney Tunes and Wacky Races for Boomerang; Mike Tyson Mysteries for Adult Swim; Right Now Kapow for Disney XD; Green Eggs and Ham for Netflix; and Young Justice: Outsiders for the upcoming DC-branded digital service. As home to the iconic animated characters from DC, Hanna-Barbera, MGM and Looney Tunes libraries, WBA also produces highly successful animated films — including the DC Universe Animated Original Movies — for DVD, Blu-ray® and digital media. One of the most-honored animation studios in history, WBA has won six Academy Awards®, 35 Emmy® Awards, the George Foster Peabody Award, an Environmental Media Award, a Parents’ Choice Award, the HUMANITAS Prize, two Prism Awards and 20 Annie Awards (honoring excellence in animation). Check out the DC Universe Original Movies section here at The World’s Finest for subsites dedicated to all of the included animated titles and shorts. Stay tuned for further updates on this release right here at The World’s Finest, including additional imagery and a review in the forthcoming weeks, and more. To discuss this release, click on the link below. Discuss this news on The DC Animation Forum! Warner Bros. Home Entertainment will release a new 30-movie DC Universe Original Movies: 10th Anniversary collection later this year, hitting digital outlets on August 15, 2017 and coming to Blu-ray on November 7, 2017. The studio says the release will include all 30 films – from Superman Doomsday to Batman and Harley Quinn, as well as newly released commemorative editions of Wonder Woman and Justice League: The New Frontier. The cllection will also include all five DC Showcase animated shorts – The Spectre, Green Arrow, Jonah Hex, Catwoman and Superman/Shazam: The Return of Black Adam. The details of the special features will be announced later this summer. Continue below for a look at the box art and the announcement details. Warner Bros. Home Entertainment and DC Entertainment celebrate a decade of heroic animation with the release of the DC Universe Original Movies: 10th Anniversary, a comprehensive box set of all 30 films, 5 animated shorts, new special features and exclusive collectible items coming November 7, 2017 to Blu-ray™. The entire 30-film set will also be available on Digital starting August 15, 2017. The DC Universe Original Movies: 10th Anniversary will include all 30 films – from Superman Doomsday to the all-new Batman and Harley Quinn, as well as newly released commemorative editions of Wonder Woman and Justice League: The New Frontier. The collection will also include all five DC Showcase animated shorts – The Spectre, Green Arrow, Jonah Hex, Catwoman and Superman/Shazam: The Return of Black Adam. The details of the special features will be announced later this summer. Warner Bros. Animation (WBA) is one of the leading producers of animation in the entertainment industry, producing and developing projects for multiple platforms, both domestically and internationally. WBA’s TV series include Justice League Action, Teen Titans Go! and the upcoming DC Super Hero Girls and Unikitty! for Cartoon Network; Be Cool Scooby-Doo!, Bunnicula, Dorothy and the Wizard of Oz, The Tom and Jerry Show, New Looney Tunes and Wacky Races for Boomerang; Mike Tyson Mysteries for Adult Swim; Right Now Kapow for Disney XD; Green Eggs and Ham for Netflix; and Young Justice: Outsiders for the upcoming DC-branded digital service. As home to the iconic animated characters from the DC Comics, Hanna-Barbera, MGM and Looney Tunes libraries, WBA also produces highly successful animated films — including the DC Universe Animated Original Movies — for DVD, Blu-ray® and digital media. One of the most-honored animation studios in history, WBA has won six Academy Awards®, 35 Emmy® Awards, the George Foster Peabody Award, an Environmental Media Award, a Parents’ Choice Award, the HUMANITAS Prize, two Prism Awards and 20 Annie Awards (honoring excellence in animation). Stay tuned for further updates on this release right here at The World’s Finest, including additional bonus content detail, pricing artwork and more. To discuss this release, click on the link below. Click on the links below to check out thousands and thousands of archived news stories. News coverage includes episode and comic previews, interviews, artwork and so much more. Features programs and movies include Batman: The Animated Series, Young Justice, the DC Universe Animated Original Movie line and much, much more. With 2014 now done and over with, the last news story from The World’s Finest has officially been posted up. As I mentioned on this site a year ago, it’s time to ease back on the overall workload of this site, and that starts with wrapping up the daily news post for the foreseeable future. Thousands and thousands of news posts, including three straight years of news posts at least five days a week, without a single weekday missed. And, with 2015 now here, that ends as The World’s Finest will return to its roots as an unbeatable resource for fans. An archive of content, a collection of materials covering a host of different shows and movies, a wealth of information – call it what you will, but The World’s Finest will be embracing that once again. What does that all encompass? Well, don’t get alarmed … it’s all good! As the site shifts into a content destination, certain aspects of the site will stop while an emphasis will be placed on others. Daily news posts will cease, as I said, and no new subsites will be added to the site as of this time. Does that mean the end of updates and new material? No – there will always be new content added here, but the site will now just be easier for me to manage. Site updates will continue going forward, reviews will still be posted, more content will be added (images, behind-the-scenes material, etc. ), along with the odd interview. However, now, the site updates will now fall more onto the resource side of things. As I said, there will be no new additional subsites added to The World’s Finest going forward, with the possible exception of smaller pages dedicated to installments of the ongoing DC Universe Animated Original Movie line. 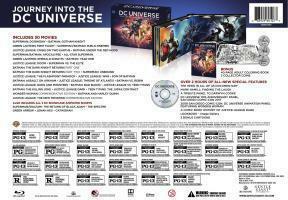 Assorted DVD, Blu-ray, and other media releases will also still be covered. A new Batman: The Brave and The Bold Blu-ray? We’ll cover and review it – 100%. New soundtrack release? We’re on it – count on it. The only thing really changing is the end of daily news posts (which, honestly, it didn’t seem like a lot of people noticed anyway, given how so many stories broken here went unnoticed or stolen over the years). A lot of factors played a role in this decision. For one, this site is too unwieldy for one person to handle. I cover about 95% of the work on the site, the forums and social media outlets. This includes emails, press work, reviews, finding reviewers and content, all of that. I spend many hours a day working on this site, volunteering countless hours. Juggling that with a regular job, a family, etc., and, well, something has to give. I have more responsibilities than ever before and there are just not enough hours in the day. But I can’t just abandon the site – no way. Given how long I’ve been working on this site, from its first iteration back in 1997, and how attached I am to it, I opted not to pass the torch. I did ask for help, more than a few times, but no one came to bat. So, I opted to scale the site responsibilities down to its skeleton in order to keep it going. I am expecting to reduce my presence and update rate overtime, though. The forum duties will be passed over to someone else entirely, for example. Still, with this, I’m able to balance my workload easier, have a bit of a better life, and explore other options. This site is not going away. It’s not going anywhere. It’s going to stay right here. There’s no way I could let it go, anyways. All the content that you see here is not budging an inch. The only thing really changing is the removal of daily news updates and an easing back on the frequency of updates. This site will always be here for you to access and explore. In fact, to this day, there are some nifty secrets still not uncovered here on the site, which tells me there’s plenty for all of you still to explore. For those worried, this isn’t the end. All you need to do is keep an eye on the “Site Updates” section to see that. Over the next few days, you’ll see the main page here change a little. The news will be replaced with links to the major site sections here, and the daily news shuffled off into an archive (where it will be readily accessible to look through). All portions of this site, I think, will be more easily accessible for those wanting to look around and just see what we have to offer. This site is the biggest DC Comics-animation (and Batman animation) site out there to this day, and I doubt that’ll change, even with the evolving trends of internet culture. But hey, no matter how much all of that changes, The World’s Finest will always be right here. If you have any questions or concerns, do not hesitate to drop a line. The social media portals for The World’s Finest will remain up until I decide what to do with them. I can be easily reached there, or through the contact links scattered throughout the site here. If all that fails, just catch me on the forums. I’d like to express a quick “thanks” to all the folks who have helped me over the years. Zach, Ian, James, Barry, Eileen, Brian, Michael and a wealth of other people I can’t thank enough. This seems like a nice moment to tip my hat to them as I follow the site through a few minor changes and lifts. For your daily news fix, which plenty of you are clearly already getting elsewhere, I suggest you keep it tuned to Toonzone and DCAU Resource. The forums right here are also a good spot for any developments or concerns, as well. I may post the odd piece up from time to time there. And that’s all from me for now, folks. If you have any questions or concerns, please feel free to ask. Don’t hesitate. That’s what I’m here for. Thanks! Discuss this at The DC Animation Forum! Be sure to keep your eye on The DC Animation Forum, The World's Finest on Twitter and this very page for site updates, exclusive content, news and special announcements! Discuss the anything and everything related to the animated adventures of your favorite DC Comics characters right here at The DC Animation Forum! Want more? Check out everything Anime Superhero Forums has to offer! Marvel fan? Check out Marvel Animation Age! Please note the updates above do not list the regular near-daily updates across the site, which include updates to assorted releases, image galleries, backstage/extra content and more. Continue below for a select list of current and upcoming releases. Episodes debut Fridays on the DC Universe streaming service (New episodes return June 2019).